The Fennimore Golden Eagles won a fifth straight SWC/SWAL Clash conference title Saturday, holding off runner-up Prairie du Chien 285.5–272. POSTED February 7, 2019 11:43 a.m.
RICHLAND CENTER — RICHLAND CENTER — The Fennimore express kept on rolling even without two of its top point-getters. Juniors Mason Lull, Aidan Nutter and Will Ahnen each claimed individual titles as the Golden Eagles racked up 285.5 team points to hold off runner-up Prairie du Chien (272) for this year’s SWC/SWAL Clash title Saturday at Richland Center. Fennimore was without senior Maguire Fitzgerald (170 pounds), a two-time state qualifier who place second at conference a year ago, and junior Luke Blair (113), who were both out with minor injuries. SWC duals champion Lancaster (ranked 4th in Division 3) finished third with 245 points. Mineral Point (#7 in D3) finished fourth with 218 points. River Valley (206) finished fifth. Lull, ranked fifth in Division 3, cruised to the 120-pound title — his first conference title — with a pin, a major decision and a pair of pins. He pinned Lancaster’s Caleb Lucey midway through the first period of the semifinals, then stuck Belmont/Platteville freshman John Burbach at the 3:25 mark in the second period to claim the title. Nutter (#4 in D3), another two-time state qualifier, won his first individual conference title with a perfect 4–0 day at 132 pounds. After a first-round bye, he pinned Lancaster’s Matthew Crosby (3:48), then scored a 12–3 major decision over River Valley’s Rowan Wipperfurth in the semis. He then gutter out a 9–8 victory over Mineral Point’s Caden Carey (29–4) in the finals. Ahnen, ranked sixth in Division 3, won his first Clash title Saturday at 170 pounds. He opened his day with a first-round bye, then received a quarterfinal forfeit, before pinning Prairie du Chien’s Tyler Smock in 1:36. In the finals, Ahnen outdueled Boscobel’s Chse Beinborn (37–5) for a 3–1 championship victory. Highland senior Drew Hennessey won the 220-pound title to lead Iowa–Grant/Highland to a sixth-place team finish. Hennessey used a first-round bye, two quick pins — 37 seconds and 21 seconsd — and an 11–4 finals victory over Fennimore’s Brayden Leffler to win the title. Hennessey was injured at last year’s conference tournament. Platteville junior Will Schaefer won the 195-pound title and freshman John Burbach finished second at 120 to lead the Belmont/Platteville co-op to an eighth-place team finish. Schaefer (35–3) dominated the 195-pound weight class with a bye, a 48-second pin, an 8–1 major decision over River Valley’s Brock Mahoney and a 9–2 victory over Lancaster’s Caden Straka (33–6) in the finals. Lancaster’s lone champion was 106-pound sophomore Remington Bontreger, who is currently ranked No. 1 in the state in Division 3. Bontreger (39–1) went 4–0 on the day and picked up 32 points for the team, following a first-round bye and back-to-back first-period pins. He then defeated Fennimore sophomore Brody Lee (#2 in D3) 8–3 in the finals. Darlington/Black Hawk senior Kolbe Ubersox (32–3) set Darlington school records for wins (152) and pins (73) en rout to winning the 138-pound title, his second career Clash title. Ubersox defeated Prairie du Chien’s Traeton Saint, 7–6, in the finals. Teammate Leif Bredeson (30–5) joined Ubersox atop the medal stand by pinning Prairie du Chien’s errod Osterkamp in 1:33 of the 285-pound title bout. Fennimore junior Alex Birchman finished second at 126 after a narrow 3–1 overtime loss to Mineral Point senior Danny Pittz, who is ranked third in Division 3. NEXT: The Golden Eagles will now compete in Saturday’s loaded WIAA Division 3 Lancaster regional. Steldt said senior Fitzgerald and junior Blair will both return to action Saturday, giving Fennimore its full lineup. Fennimore is the favorite to win the regional and a berth in Tuesday’s WIAA D3 team sectional that will be held at FHS, but will face challenges from Southwest Wisconsin Conference duals champion and fourth-ranked Lancaster, seventh-ranked Mineral Point, as well as Iowa–Grant/Highland, Darlington/Black Hawk, Boscobel and River Ridge/Cassville. The top two finishers at each weight class will advance to the D3 Mineral Point Sectional, that will be held Saturday, Feb. 15. Belmont/Platteville, Cuba City/Southwestern/Benton, Richland Center and Dodgeville will travel to the WIAA Division 2 Prairie du Chien Regional on Saturday. 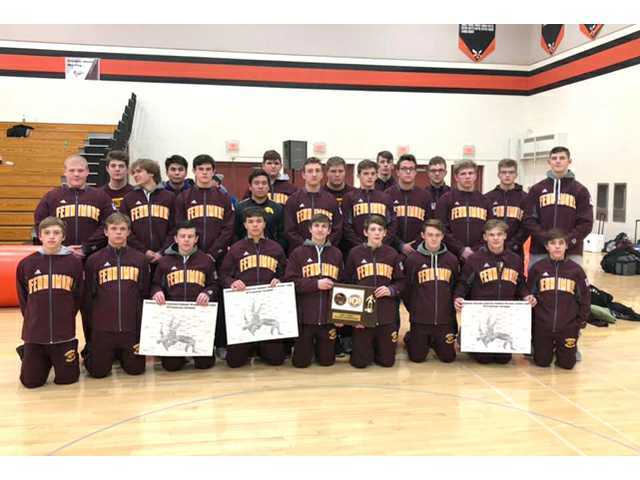 Team scores — 1.Fennimore 285.5, 2.Prairie du Chien 272, 3.Lancaseter 245, 4.Mineral Point 218, 5.River Valley 206, 6.Iowa–Grant/Highland 170,5, 7.Darlington/Black Hawk 158, 8.Belmont/Platteville 132, 9.Cuba City/Benton/Southwestern 126, 10.Dodgeville 102.5, 11.Boscobel 77.5, 12.Riverdale 74, 13.Richland Center 61. 113 — 1st Place Match - Matt Rogge (Prairie du Chien) 22-2, So. over Carter Lull (Lancaster) 28-8, So. (Dec 8-5).